Mean Well Waterproof LED Power Supply 100W - 24VDC NEW! This product is a 100W Mean Well Brand, 24VDC LED transformer / power supply, 100-240VAC input, with 24VDC output. IP67 rated for wet or damp locations. Has one 10" long 24VDC output connection that can be used to power 24VDC Constant Voltage LED Strip Lights, LED Wall Washers, LED Fixtures, RGB LED lighting and other 24VDC Constant Voltage LED Lighting products. Comes with built in short circuit, overload, and over voltage protection. 100-240VAC input wire colors are as follow: Brown - Load, Blue - Neutral. Output wires are Black - DC negative and Red - DC Positive. 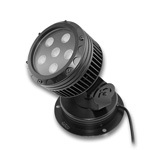 Non-submersible, non uv-proof, UL recognized, RoHS, FCC and CE approved. Our high end, commercial grade UL Listed Ribbon Star Ultra, White is an Ultra bright, weatherproof and outdoor rated 24VDC waterproof LED Strip Light. With a 24VDC power rating this Strip Light is the brightest waterproof strip light that we sell. The IP67 encapsulated silicon coating makes this strip waterproof (non-submersible), dust and UV proof. Ribbon Star Ultra 24V LED Strip Light provides a perfect light source for any indoor, outdoor and underwater lighting projects. The Strip Light can be cut every 2 inches and can be connected in series up to 30ft with no noticeable voltage drop. 6 SMD LEDs per 2 inches with a total of 360 LEDs per 3m. At 5.4W per foot, a 3m roll would require at least a 60W, 24VDC power supply. 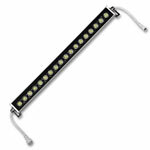 This LED strip light is perfect for any, indoor, outdoor or underwater lighting project. 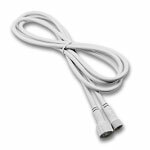 Use with outdoor architectural features, decks, trailers, yachts, boats, RV's, dog kennels, landscaping, business trim, pathway lighting, or any other situation that a fully outdoor proof LED Strip Light is needed. Comes with male and female connectors on each end, 3M VHB mounting tape, 10 mounting clips and 4 end caps. Requires a 24VDC Constant Voltage power source. 6000-6500K Color Temperature. 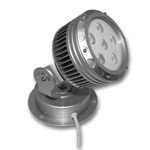 UL Listed for class2 luminaries and fixtures, RoHS and CE approved. Our commercial grade UL Listed Ribbon Star, Warm White is an Ultra bright and dependable outdoor rated 24VDC waterproof LED Strip Light. With a 24VDC power rating this Strip Light is the brightest waterproof strip light that we sell. The silicon coating gives Ribbon Star Ultra an IP67 outdoor rating. Making it waterproof (non-submersible), dust and UV proof. Ribbon Star Ultra LED Strip Light provides a perfect light source for any indoor, outdoor and underwater lighting projects. The Strip Light can be cut every 2 inches and can be connected in series up to 30ft (10m) with no noticeable voltage drop. 6 SMD LEDs per 2 inches with a total of 360 LEDs per 3m. At 5.4W per foot, a 3m roll would require at least a 60W, 24VDC power supply. This LED strip light is perfect for any outdoor or underwater lighting project. Use with water features, decks, trailers, yachts, boats, RV's, dog kennels, landscaping, business trim, pathway lighting, or any other situation that a fully outdoor proof LED Strip Light is needed. Comes with male and female connectors on each end, 3M VHB mounting tape, 10 mounting clips and 4 end caps. Requires a 24VDC Constant Voltage power source. 3500K Color Temperature. UL Listed for class2 luminaries and fixtures, RoHS and CE approved. Our heavy duty UL Listed 24VDC color changing RGB Lux LED Strip Light is encapsulated in a commercial grade IP66 waterproof housing using 252 super bright 3 in 1 RGB SMD 5050 LEDs per 118" to produce over 16 million shades of bright, vivid, and brilliant color. The strip is encapsulated in a durable silicon waterproof coating that provides protection from dust, moisture and UV. There are 6 5050 type surface mount LEDs every 2.75 inches. This 118" (3m) roll is excellent when you need a very colorful indoor or outdoor RGB light strip. Comes with 3M™ VHB™ mounting tape on the back, for the best long-term mounting solution. 54W of constant voltage 24VDC power needed for this 118" strip (5.4W per foot). This RBG LED light ribbon can be used for interior or exterior entertainment lighting, bar lighting, casino lighting, landscape lighting, yacht lighting, 24V Marine applications, patio lighting, deck lighting, or any other indoor or outdoor 24VDC application. 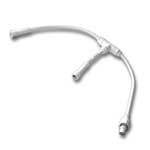 Each roll includes a waterproof connector to bare wire at each end, all other accessories are sold separately. This LED Strip is UL Listed for class 2 luminaries and fixtures, RoHS and CE approved. This product is not intended to be submersed or used in underwater applications.